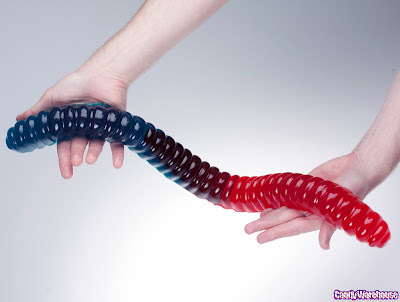 Behold, the Giant Gummy Worm – gentle leviathan of the gummy candy universe. This benign, segmented invertebrate might be low on the evolutionary totem pole compared to the mammalian gummy bear, but what it lacks in complexity it more than makes up for in delicious dual-flavored gummy goodness of Blue Raspberry and Red Cherry. 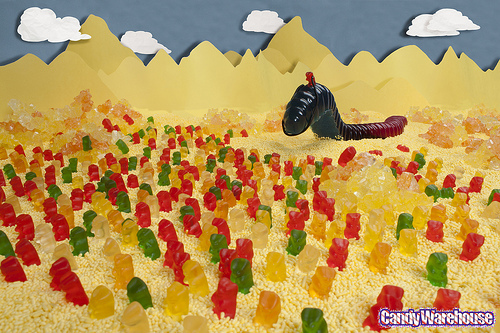 Primitive candy-loving tribes would hunt these noble creatures in dirt made of cookies and pudding in hopes of feeding their families for weeks. Now you can do the same by ordering one.